Meg Mac has today revealed the beautiful video for new single offering, ‘Something Tells Me’, directed by Claudia Sangiorgi Dalimore. Discussing the video, Meg said, “Claudia captured my last single ‘Give Me My Name Back’ beautifully and was wonderful to collaborate with and easy to bounce ideas off. I wanted this video to be simple, it needed to capture my performance of the song and present a sense of the push and pull forces that surround you when you’re trying to make difficult decisions in your life”. ‘Something Tells Me’ was written by Meg with Grammy nominated Melbourne songwriter Sarah Aarons and produced by ARIA and Grammy Award winner M-Phazes. Meg is currently touring through North America, before heading to Europe and the UK. 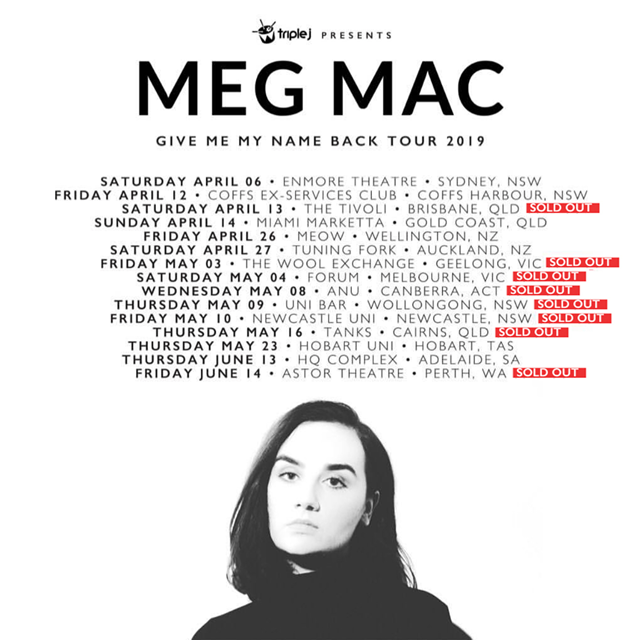 She then returns home for her GIVE ME MY NAME BACK headline shows from April – June, with support from local up and coming star Fergus James.